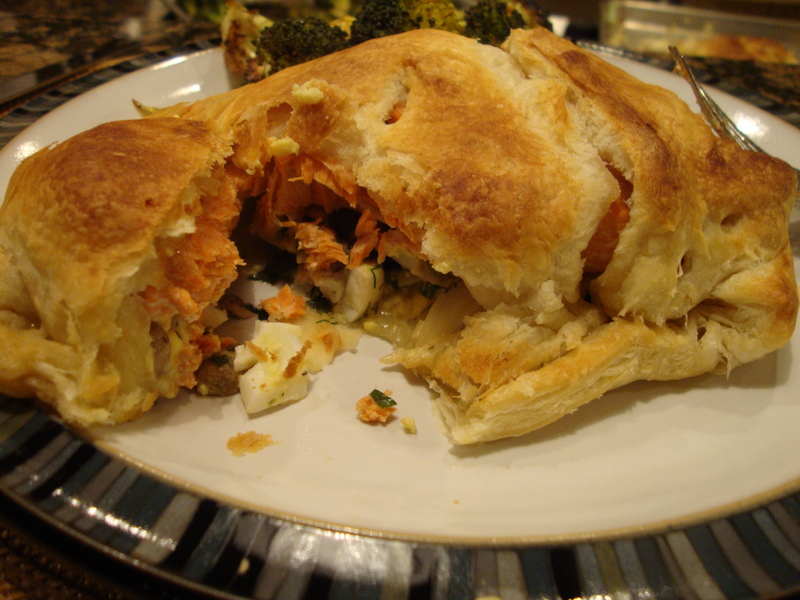 I’ve never cooked anything “en croute” so I loved the idea of this salmon en croute, courtesy of Rachael Ray. 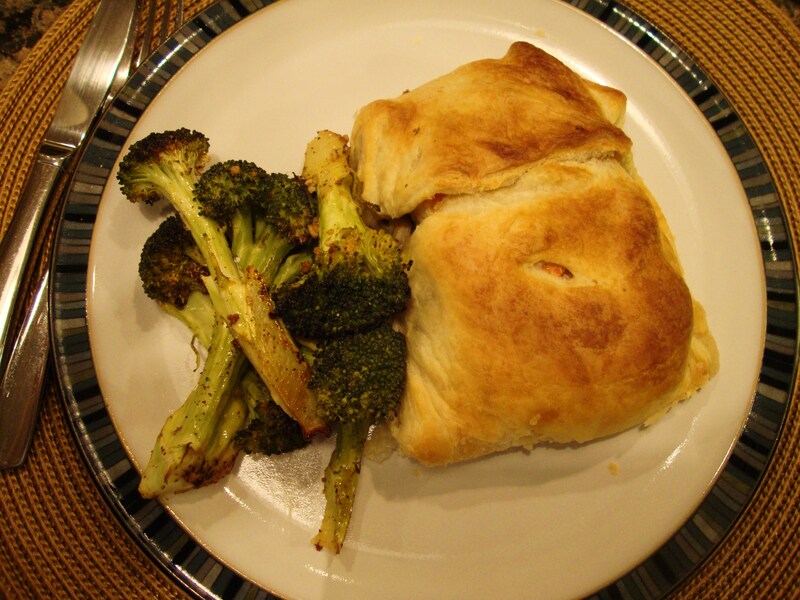 First of all, it was a lighter version of your traditionally heavy pastry-encrusted foods (think beef Wellington or creamy chicken pot pie). Throw in some salmon instead and you don’t feel quite as guilty! Second, mushrooms were involved, one of my top faves. And third, it was kind of fancy and fun — something that could be a hit for a future dinner party. And it did turn out looking impressive, if I don’t say so myself! The verdict — it was quite good. The mixture inside with the salmon — made up of mushroom, onions, lemon juice, dill, parsley and the odd-ball hard boiled egg — was tasty and went really well with the salmon, though I’m still on the fence about the egg. It was a liiiittle weird, but worked in a strange way. I also wasn’t wild about my choice of broccoli to accompany — next time I’d do green beans or sauteed spinach with some lemon. 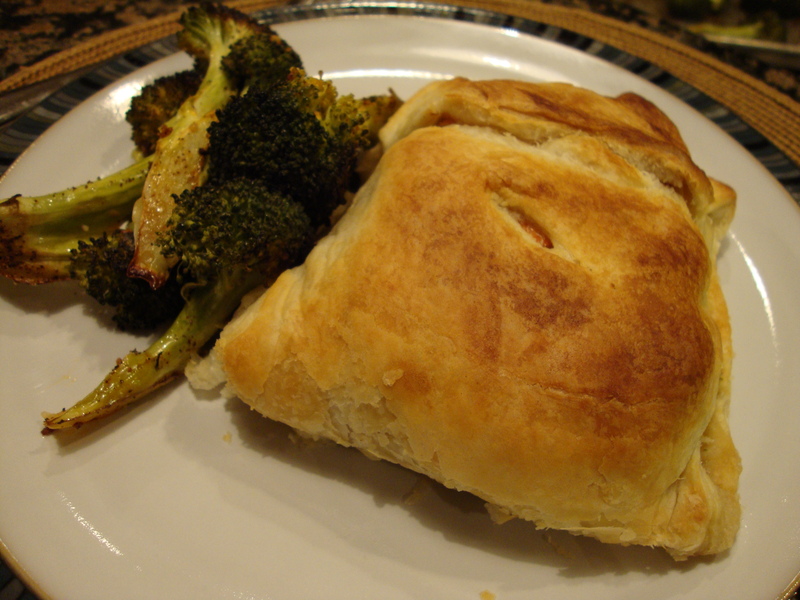 But the combo of the dill and lemon with the mushrooms and salmon, plus the crunch and richness of the pastry…it was an awesome combination of tastes and textures. 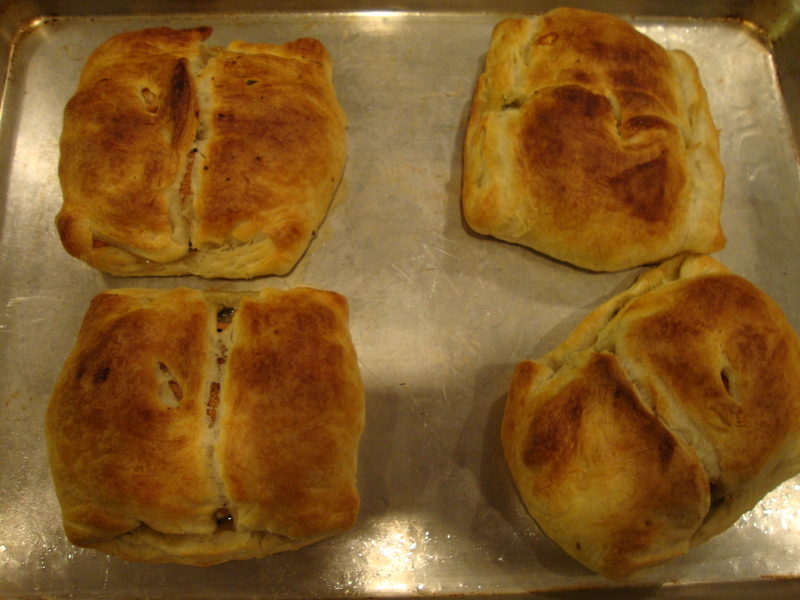 These tasted great straight out of the oven, but reheating them was problematic. I didn’t dare nuke them — it would have killed the crispiness of the pastry — but the oven dried out the salmon a bit and it wasn’t nearly as tender. So, I’d aim to cook just enough for one night’s meal. 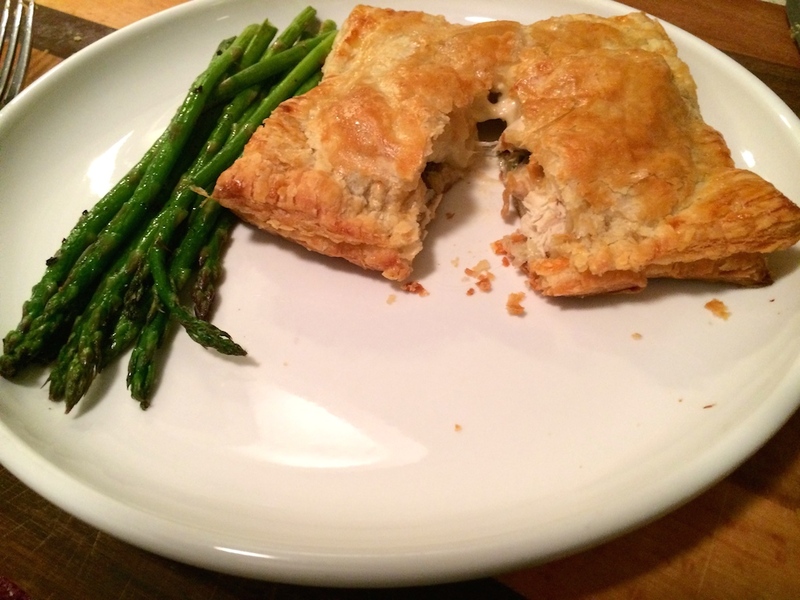 Don’t be afraid to heap the mushroom mixture on the pastry dough. The “couple spoonfuls” Rachael calls for isn’t enough. Buy your salmon without the skin — removing the skin is not fun. I didn’t follow directions and flip the salmon over once I packaged it up so the seam was on the bottom — that would make it look a little nicer, especially if you cut 2-3 slits across the top with a knife before baking. 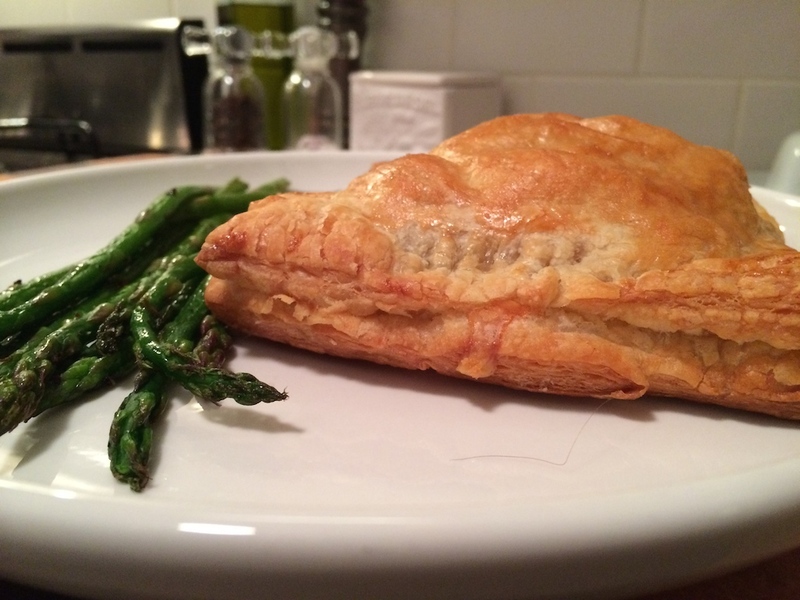 If I did this again, I wouldn’t cook the salmon as much ahead of time — just a quick sear — so it was medium when you cut through the pastry packet. Two minutes per side was too much for the thickness of my salmon. This could be yummy if you made them as little mini bites for a cocktail party. Heat a large non-stick skillet over medium heat. Add oil, onions and mushrooms. 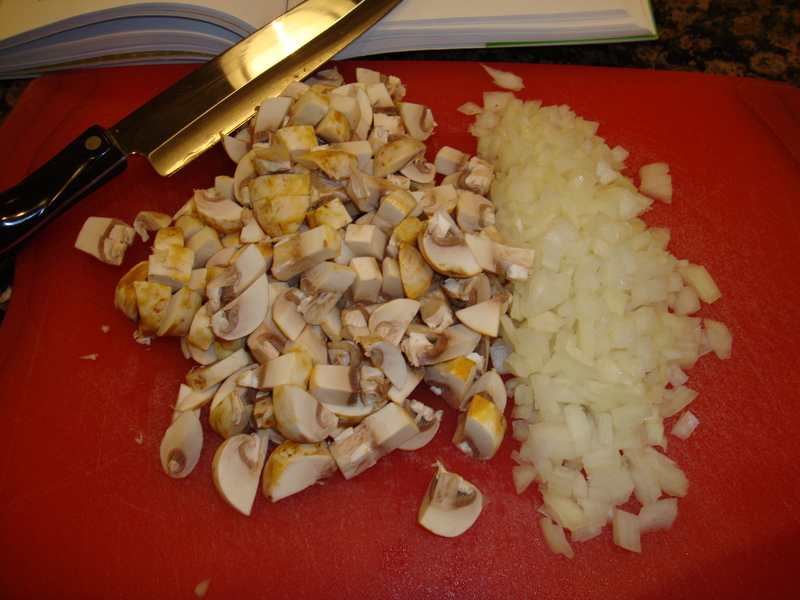 Season with salt and pepper, and sauté 10 -15 minutes or until the liquid from the mushrooms has evaporated. Remove from heat and add to a medium-sized mixing bowl. Add dill, parsley, lemon juice, mustard, hard-boiled egg, salt and pepper. Mix to combine. Wipe out the pan you used for the mushrooms and return it to medium-high heat with a drizzle of EVOO. Season salmon with salt and pepper, and sear 1-2 minutes on each side in a drizzle of oil. Remove skillet from the heat. 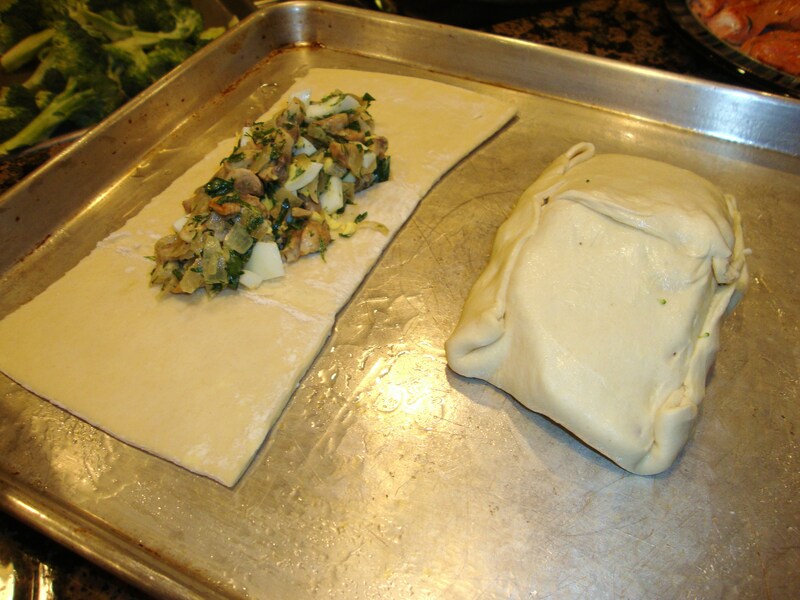 Spread the puff pastry sheet onto a counter and roll to 1/8 of an inch thick. Cut in half. 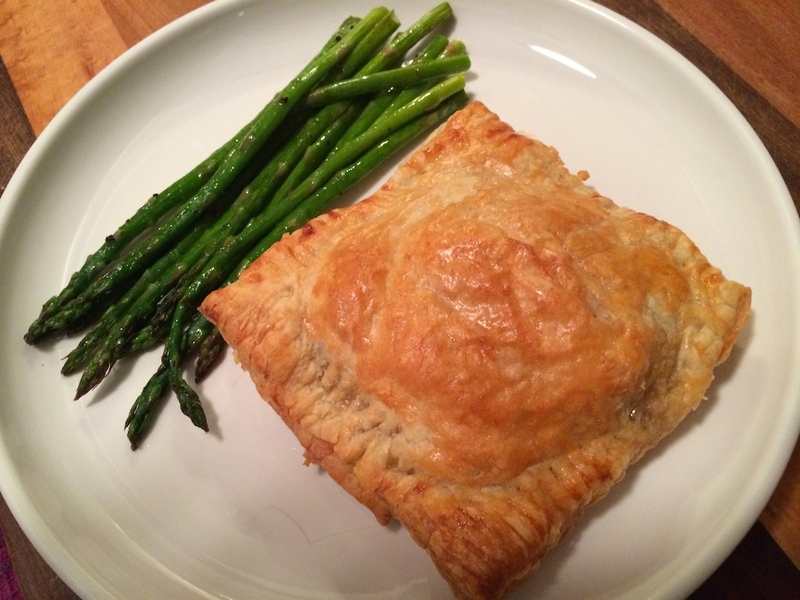 On each rectangle of dough, place 2 spoonfuls of the mushroom mixture and top with salmon. 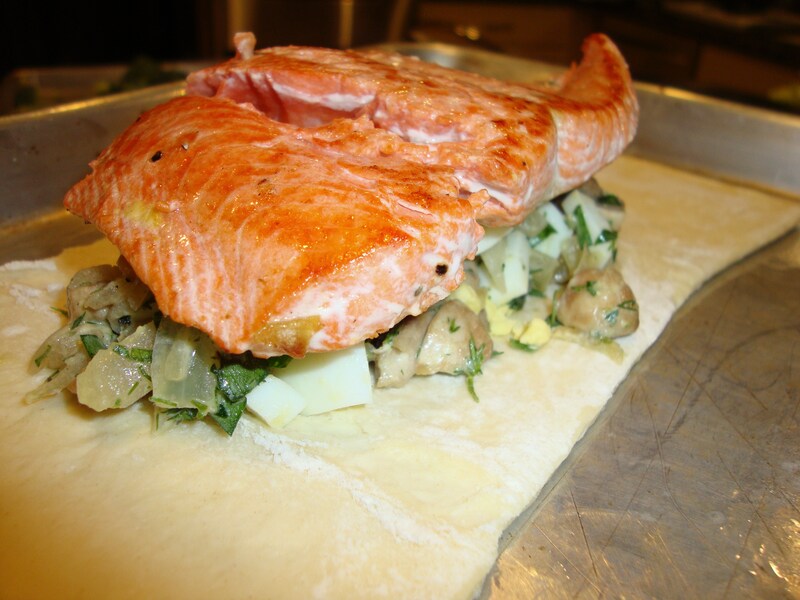 Starting with the corners, wrap dough over the salmon, creating a package. Trim excess dough and seal with the egg water mixture using a pastry brush (leftover dough bits can be used to decorate the top of the packages). Place sealed side down on a non-stick cookie sheet and make small slit in the top to let steam escape. Brush with a light coating of the egg/water mixture to give it a nice sheen. Bake 10-15 minutes or until golden brown. Let stand 5 minutes, then serve.